To prepare this event a questionnaire “tracking down discrimination between men and women” has been sent out. Almost one thousand have been filled out and sent back. Representatives of the Abrahamic religions (Protestant, Catholic, Orthodox Jewish, Muslim) had about 10 minutes to speak about the situation and places of women in their religions. 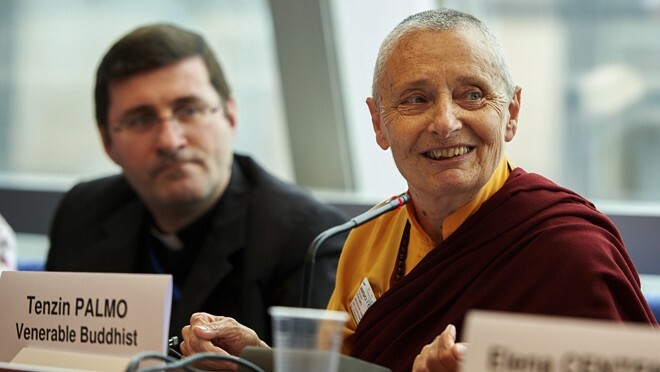 Jetsunma Tenzin Palmo exposed the Buddhist perspective. As the time for a deeper going debate was limited, the next day the discussions continued and Dr. Carola Roloff (Senior Researcher Academy of world religions Hamburg) took an active role in the exchanges. During a third meeting suites to consider from discussions as well as an action plan have been elaborated. As the focus of the Council of Europe’s agenda lays on non-discrimination and an inclusive society our proposal to continue our research and work will hopefully have sufficient support to be continued. The platform for permanent dialogue amongst all convictions proposed by Parliamentary Assembly of the council of Europe, could be a very relevant framework. We hope that it will be set up as soon as possible. I am assuming that everybody here knows who the Buddha was? Soon after the Buddha’s enlightenment around the 5th century B.C., he made the proclamation that he would not pass away into the great Nirvana until he had established the great community of monks, nuns, laymen and laywomen. So right from the start his vision was that all his followers, both monastic and lay, should study, practice and propagate his message. So in Buddhist history, it is not that there have not been great nuns and laywomen. The reason why we don’t hear much about them is of course because the men wrote the books. This is true of all religious scriptures not just Buddhism. Everything is written from the male point of view and therefore of course women are often portrayed as the dangerous other, ready to pounce on the nice innocent males. The feminine is out there waiting. So, as a result, most scriptures had a somewhat misogynistic slant to them. If they had they been written from the feminine perspective it would sound very different. But nonetheless in Buddhist history up until the present day, women have managed to hold their own despite the fact that often they have not been given too much encouragement. Buddhism as it travels to various countries such as China, Thailand, Sri Lanka, Tibet, Japan and so on, is very adaptive wherever it goes. The Buddha dharma takes on the colouring of whichever culture it happens to meet with. I was thinking yesterday that it’s rather like we have a cup or a vase or a jug or whatever, but although the outer shape changes, but the liquid inside stays the same. So likewise, Buddhism as it goes around the world takes on the cultural aspects of the country where it settles but nonetheless it keeps its own inner identity. So likewise, if we ask, what is the role of women in the Buddhist world, a lot depends on the culture of that particular country, which may or may not have been influenced by the Buddhist view of women. The Buddhist view is that women are perfectly capable of attaining to enlightenment. In fact in the later Mahayana tradition women are considered to be the nature of wisdom. Perfect wisdom - like Sophia - is portrayed as female, and so there is the understanding that the feminine embodies the nature of true reality. It is not that we have to acquire wisdom but that we are already of that nature. So, in some Buddhist countries today such as Taiwan, or increasingly in mainland China, Korea, Vietnam and so forth, there are far more nuns than monks and there are also more devoted laywomen than there are lay men. Many Buddhist associations are run by women because nowadays women are educated. That is the key point. As women become educated, so they take on more and more leadership qualities. In Southeast Asia up until now, women were denied advanced education so therefore their voice is more muted, but it’s growing stronger. In the Himalayan areas with which I am most familiar, the status of women has taken a quantum leap in the last 25 years. The nuns in particular are unrecognisable from when I first met them back in the 1960s. This year for the first time in Tibetan history about 21 nuns are going to receive the Geshe degree from His Holiness the Dalai Lama. A Geshe degree is like a Doctorate of Divinity, and previously this was only granted for monks. These nuns themselves will become teachers. So as education spreads throughout the ranks of women in all of these Asian countries, likewise their sense of confidence and their ability to contribute increases. Women now are finding their voices. Finally. And what their voices are going to sound like we haven’t really found out yet. But we hope it doesn’t just echo the male voice; that they will find their own very unique contribution. Another point is that nowadays nobody is hindering that, since on the whole the Buddhist monks and the scholars have all been supportive and helpful in advancing the position of nuns and laywomen in the Buddhist world. So, we will check again in another 10 years time. Thank you!